ASUS brought us the thermal armor concept back in the X58 days with the Sabertooth and although the concept has skipped a chipset or two, this is the first time we’ve seen it implemented on a micro-ATX board… and we like what they’ve done. When looking at a motherboard, regardless of it’s form factor, it usually falls into one of three categories: Standard/functional, Gaming or Overclocking. There is usually some overlap between the gaming and overclocking boards due to their enthusiast target market but the Gryphon has a different focus which makes it more interesting. The Z87 Gryphon is built for longevity and reliability – and it’s more of a “Jack of all trades” as it doesn’t really fit into any of the typical categories. ASUS sent us a review sample of the Z87 Gryphon motherboard with matching Armor kit and I spent a month checking it out in an open air test bench with a tower cooler, then in a case with water cooling to see if the armor was truly special or a gimmick. In the end, you will see why this board carves out its own niche in the market and while it might not be for everyone, it’s going to be right on the money for some people. The Gryphon comes um… well.. “naked” by default as the Thermal Armor kit is available separately. This is great for consumers as it allows them to choose now or later on if they really want the armored version. 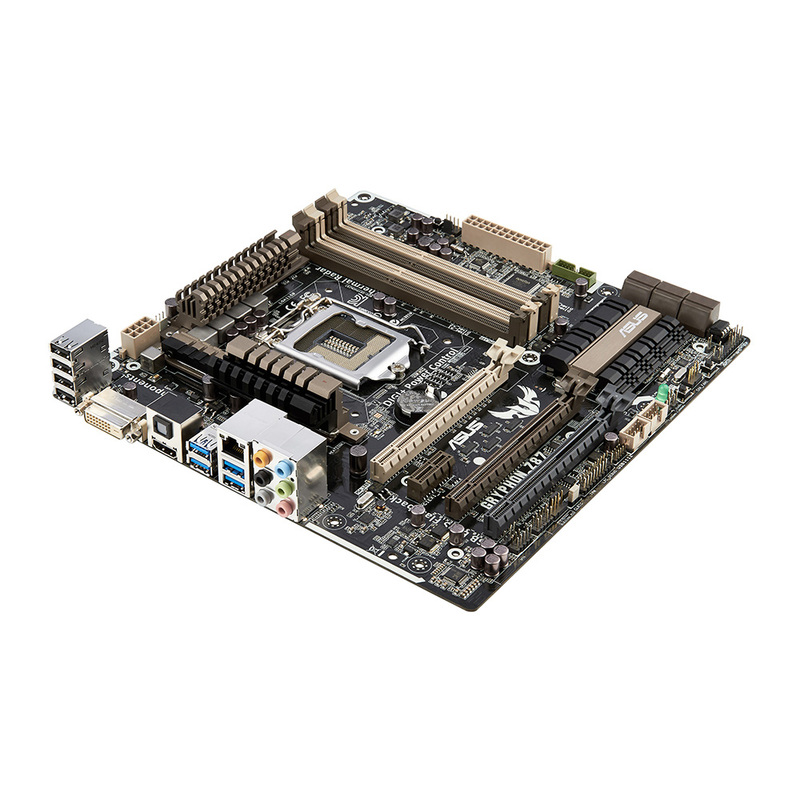 On the Sabertooth boards, it’s part of the deal so the Gryphon is a good start for those wanting a TUF series board with SLI but on a moderate budget. Pete wrote a article on this site a while back about hardware longevity and the benefits of buying quality and higher spec to make get longer out of a purchase. The design of the Z87 Gryphon takes this to a new level, ASUS has used components with military grade ratings, produced an optional kit to protect the components from dust and physical damage as well as backing their product with a 5 YEAR WARRANTY. 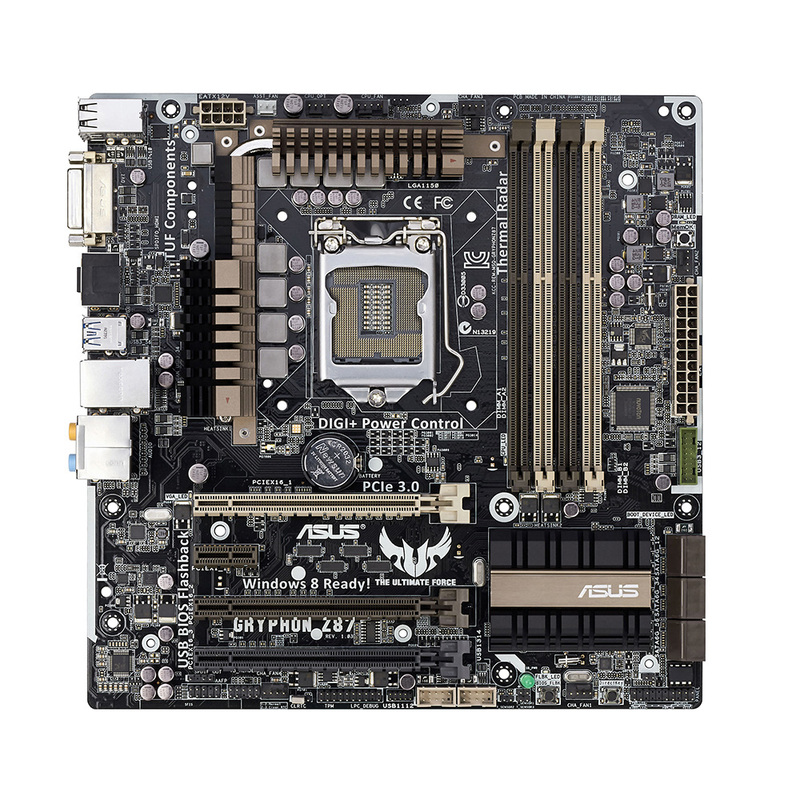 In terms of build quality, it’s all there and it’s also one of the cheaper SLI qualified motherboards available. If you are looking for a board to grow old with, this one could be your best friend. To ensure that all components get sufficient airflow to dissipate the heat, especially in a small chassis with limited or no airflow due to cables or other components. To divide the space inside the chassis into two separate thermal zones, above and below the armor. The concept is to help prevent the hot air coming from a heat source (most possibly the VGA cards) from blowing directly onto the onboard components. To repeal dust that may be congested over time, preventing the possibility of component failure when undesired moisture comes. To prevent PCB scratch and SMT components from been scratched out of the PCB during improper installation of add-on cards or when there is insufficient light during system assembly. When you look at the Gryphon without the armor, it looks rugged and maybe a little plain. There are no power, reset or overclocking buttons, no LED error code display and the colour scheme is military stlye drab. This is also what makes the board great – the TUF series boards are the only boards I’ve found that blend in well with the beige and maroon Noctua fans. There is an absence of features that many gamers are happy to live without like the onboard switches, an extra SATA controller and more USB 3.0 ports. The heat sinks have a military look to them and the colour palate used by the designers suits the concept. It’s also not going to be a crime to attach the armor kit and cover most of the motherboard with a black plastic shroud. 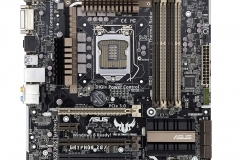 The connectors and heat sinks are a mixture of beige, olive green, brown an charcoal/black – no candy apple red, bright green, yellow or blue to be seen here.